Dreams don’t come true without a bit of outside help; someone else has to wave the magic wand and give you permission to go to the ball. My debut novel, Stop the Clock, is published on Thursday 16 August, a big day for me which wouldn’t be in the offing without the hard work and encouragement of numerous other people along the way. The publication of Stop the Clock represents the culmination of more than three decades of wanting to be a writer, and an awful lot of pens, printer ink and paper. I’m very grateful to my agent and to my editor and the rest of the team at my publisher, Black Swan, for transforming my manuscript into the finished book that will hit the shelves on Thursday. It’s been one hell of a ride – now for the final fast downhill run! None of it would have happened without the back-up of my husband, the poet and writer Ian Pindar, an editor par excellence who always has a cool head in an IT crisis. Ian has a sharp eye for a redundant word, and a disciplined attitude to work that I’ve tried to emulate. It’s always very reassuring to have him look over something before sending it out into the world. He’s also a dab hand with a camera. He took the photo of me on this blog, which makes me look at least five years less tired than I really am. @AlisonLMercer Just finished reading Stop the clock. Couldn't put it down, even on ibooks. Loved the characters and the insights. Go Ali! 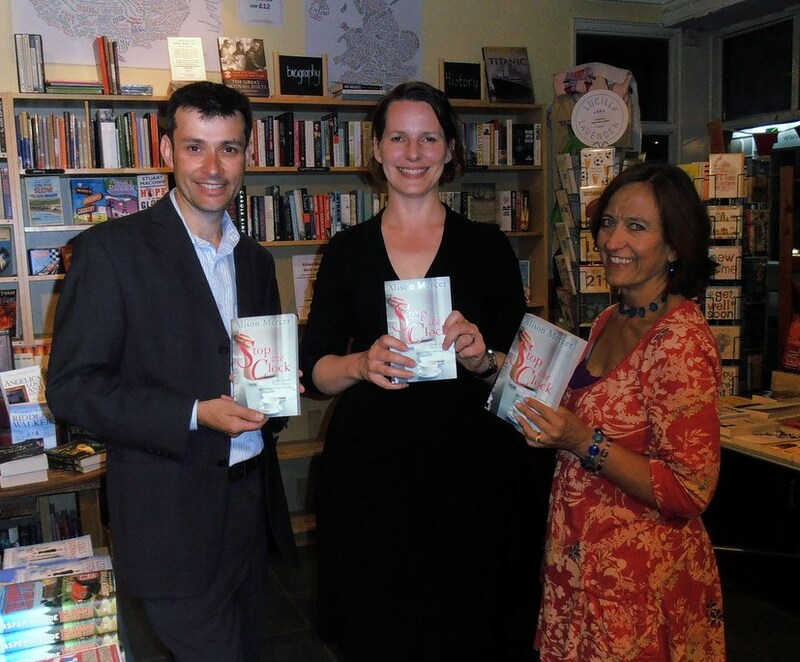 Ian was one of the book’s first readers, but there were others who helped to get it through the early stages too. Books that give advice about creative writing often talk about how, when you’re writing, you should imagine the ideal reader, the sympathetic audience that is receptive to what you have to say, and willing you to say it. It’s a bit like the scenes in the film The King’s Speech where George VI speaks directly to his speech therapist rather than to the terrifying masses. I was lucky to have just the right reader at each stage in the development of my book. They take pride of place in the acknowledgements. Stop the Clock is a book about friendship, and I wouldn’t have been able to write it if it wasn’t for my friends, though I’m grateful that we haven’t had quite such a fraught time as Natalie, Lucy and Tina. Thanks are due to my family too, and my children, without whom Stop the Clock would never have got started. My experience of working on the book over the last three and a bit years has been bound up with what has been happening in my family, in particular my son’s diagnosis with autism. It’s been a strange, intense time, but while the future is always uncertain, I think we feel much better placed to face up to it now than we did a couple of years ago. So thank you to all the people who have cared for and taught him, and advised us on how to help him, and to our lovely, supportive local community. 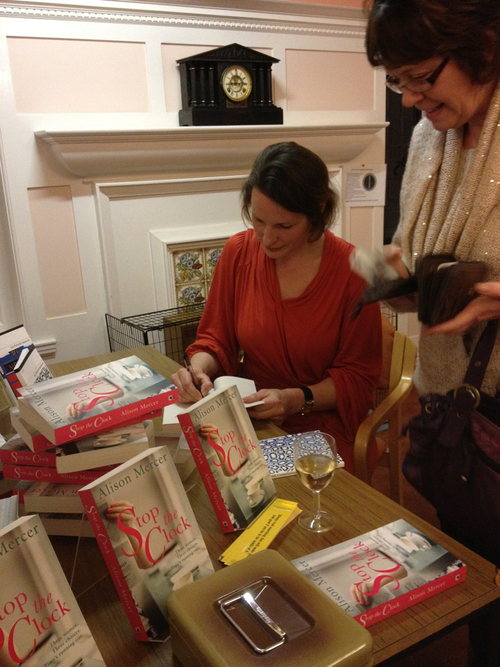 I’m really looking forward to the launch of Stop the Clock in our home town week after next. Finally the time has come for the book to make its way into the world! I feel like a mother on a child’s first day at school, waiting at the gate, peering at the playground and realising that what happens next is out of her hands. Part of parenting is letting go. So goodbye and good luck to Tina, Lucy and Natalie, the three main characters who originally existed only for me and a handful of others, and now are ready to tell their stories to anyone who wants to read them. @AlisonLMercer I look forward to your next book. 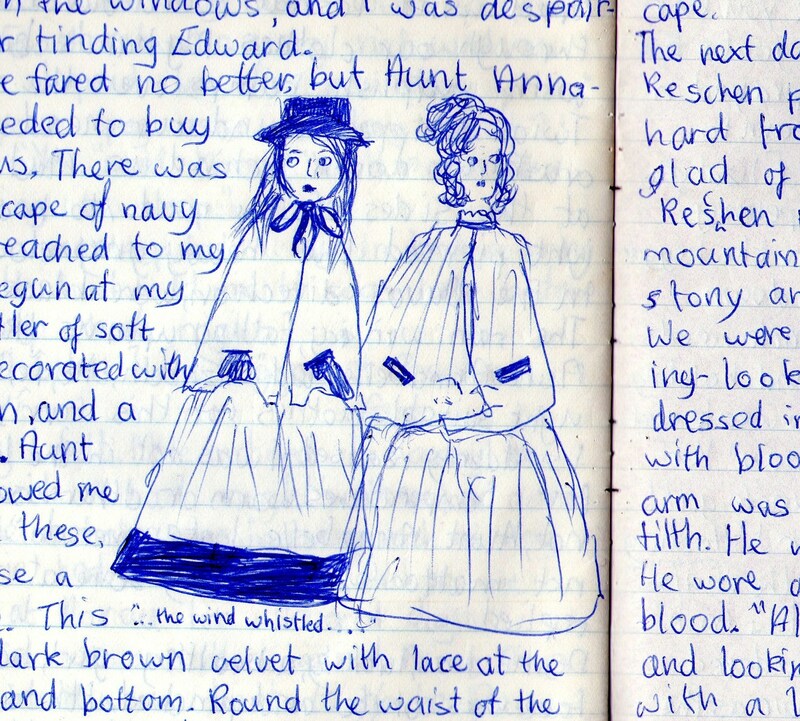 You're an awesome writer (and were even as a teenager). @AlisonLMercer I think it was the first birth. Just felt amazingly honest writing and I couldn't stop reading. Here’s the final cover of Stop the Clock, my debut novel, which is due to be published on August 16. Let the printing presses roll! It’s just such a luxury: that little bit of time. That’s what this image makes me think of. Also, I like her pink nail varnish! Captain Corelli’s Mandolin by Louis de Bernières – anyone who was in London in the mid 90s will remember when this jolly blue-and-white cover, which looks like a naive painting, was absolutely everywhere on the Tube. 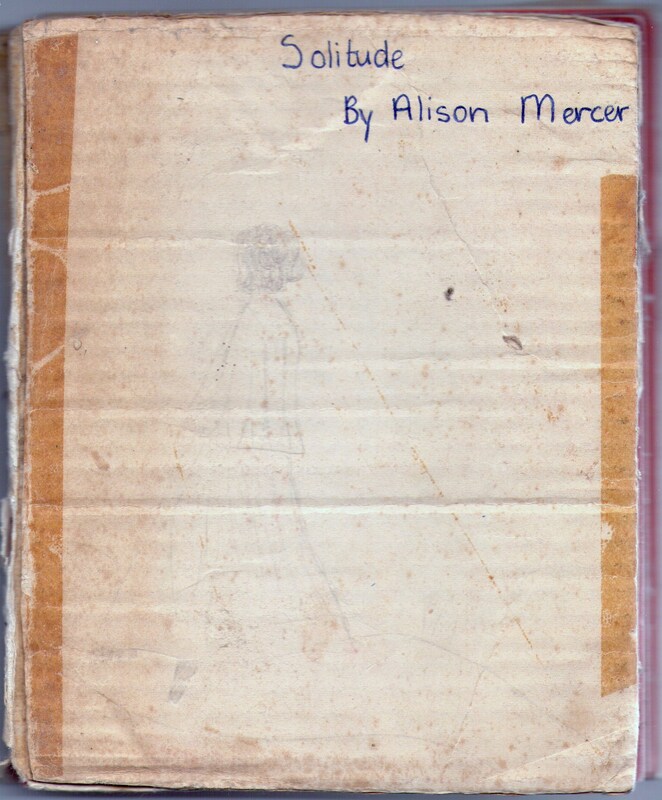 The cover of my other first novel, which I wrote when I was at primary school, has suffered a bit from the passage of time, but you can still just about make it out – here it is! We marched down the aisle, my head on his shoulder, the white dress trailing behind me. 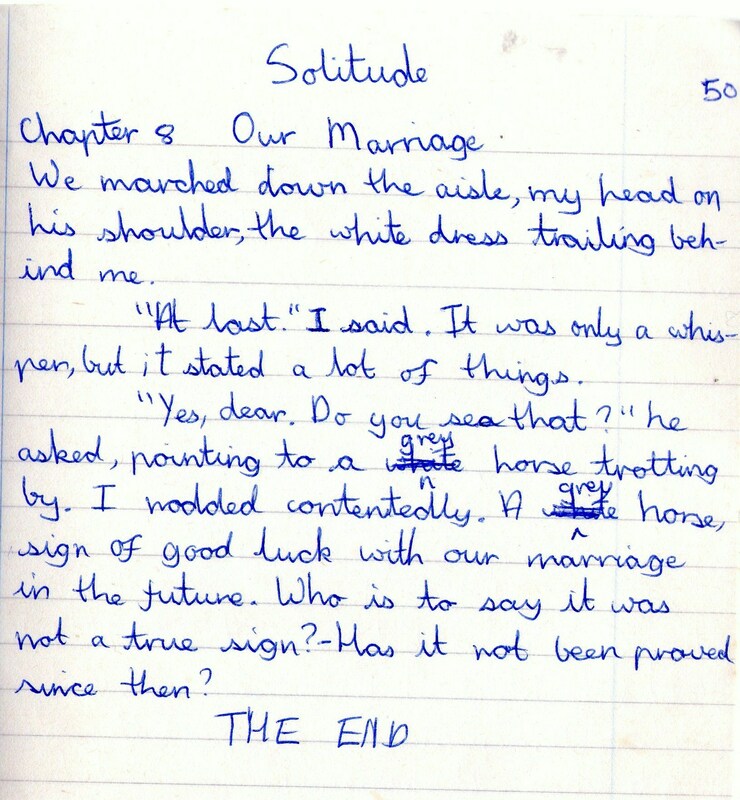 And that was the beginning of the end of my very first novel, finished in, er, circa 1982. I think someone did point out at the time that you might get unromantic neckache if you marched down the aisle with your head on your husband-to-be’s shoulder. But never mind. Inspired by a blog post on Novelicious.com, I thought I’d drag Solitude (illustrated and published, with hand stitching and sellotape, by the author) out into the light of day. I was proud of it at the time… I still remember how astonishing and heady it was to get through to THE END, and how I never quite believed I’d get there before I did. I think that still holds good – I felt pretty much the same way when I finished Stop the Clock. Though I promise you it doesn’t end with a heroine with neckache. Anyway, you have to start somewhere, and for me the start was Elizabeth Davis and her faithful servant companion (!) Dorrie, traipsing round Europe at the beginning of World War I in search of Elizabeth’s beloved Edward. Not quite sure where he had gone or why, but I think it turned out to be something to do with a mad wife in an attic and a house burning down. I was quite immune to Anxiety of Influence. Fast-forward 30 years, and Stop the Clock is also about women looking for what they think they want.. but then getting it doesn’t turn out at all the way they might have expected.